When ear plugs for sleeping become a permanent part of your nightly bedtime ritual, it is time to try reusable ear plugs for sleeping. Foam ear plugs are disposable and should only be used once before being replaced; moldable ear plugs are good for a few uses, but eventually lose their tackiness. One pair of reusable ear plugs for sleeping, on the other hand, can last for weeks with proper care. Because comfort is paramount when it comes to sleeping ear plugs, we have collected here only those reusable ear plugs which are comfortable enough to wear during sleep. That means these reusable sleeping ear plugs don't have any hard stems or other bits that protrude from the ear. It may take some experimentation to find a reusable ear plug that fits your unique ears comfortably enough to help you sleep well, but finding the right reusable sleeping ear plug to replace those disposable plugs can start saving you money night after blissful night. (NRR 30) Dream Soft GelFoam Ear Plugs provide the comfort of GelFoam™ material and the easy insertion of HearRight ear plugs, all in a smaller, softer package designed to help women get better sleep. Block snoring with these super soft, gel foam ear plugs for sleeping. (NRR 32) One pair of SilentEar Reusable Ear Plugs with hi-viz yellow flanges and durable carry case. If you have never tried SilentEar, we highly recommend one of our trial packs to help insure that you get a proper fit. (NRR 32) Heartech Silentear Reusable Ear Plugs are the highest rated reusable ear plugs available anywhere at any price. Ideal for sleeping and daily wear. Fits comfortably under helmets for motorcyclists, too. (NRR 32) This pack has two pairs (one average and one small) to let you find which will fit you best. Ear canals are unique as fingerprints. If you have never tried SilentEar, this trial pack is highly recommended. The special sleep filter guarantees that all ambient noises are attenuated, while ensuring that loud and high noises such as the doorbell or children calling remain audible. (NRR 16) Designed for all-night wear and protection from disturbing night time noises such as snoring, noisy hotel rooms, traffic noise, and more. The low-profile fit and excellent comfort make Crescendo Sleep especially ideal for night-shift workers and people with snoring spouses. Discount pricing is available for orders of 10 or more pairs. Please email info@earplugstore.com for pricing. Flare Audio Sleeep Solid Aluminum Ear Plugs feature a dense solid metal core that prevents all sound from entering your ear canals. Block out snoring and other disturbing noises. So tiny it almost disappears into your ears; great news for side-sleepers. Double-tipped in soft foam for extraordinary comfort. These ear plugs only block out mild to moderate noises, particularly in the high registers. 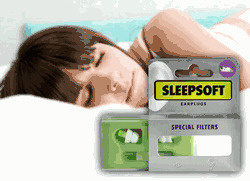 This makes these ear plugs perfect to block out gentle snoring, the hum of the AC, or other light night time noises. You'll still be able to easily hear voices, kids crying, or your alarm clock. Flare Audio Sleeep Pro Solid Titanium Ear Plugs feature an ultra-dense solid metal core that prevents all sound from entering your ear canals. Excellent for severe low-frequency snoring. So tiny it almost disappears into your ears; comfortable for side-sleepers. Double-tipped in soft foam for all-night comfort.